CLONE's third. This one debuts Ria Mariano as CLONE vocalist and includes 6 songs and 4 instrumentals. Guest vocalists include Yumi Calderon and Cholo Mallillin. CLONE's second outing. A 5-track EP. Four new studio tracks, all instrumentals at 160bpm, and a 24-minute fifth track which is a live in-studio jam of some of the EP's songs. Produced February 2003. 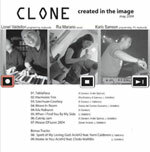 CLONE's first album. Three members, 7 full vocal songs, and 7 instrumentals. Never quite fully mastered, never quite fully finished. Nevertheless, in its rawness lies its appeal. Produced 1999. Price: Philippine Pesos PhP 150.00 + shipping/ USDollars $5.00+ shipping. 1. Title of CD(s) you want. 2. Your name, mailing address, telephone number. Order confirmation and further instructions will be sent via email. Basically, what will happen is: you will deposit money into our BPI bank account and I will ship the CDs to you via mail courier. If you are outside the Philippines, instructions will be sent to you as well.